AutoElevate is a patent pending, cost effective way to secure your clients by managing admin privileges. Ever get called on a Friday night or a Sunday morning by a VIP client demanding immediate access to install something that required admin privileges? Or have you already granted certain users with admin privileges against your better judgment, and now you’re just hoping that they are as smart and responsible as they claim to be? The challenges of limiting client permissions and controlling how much risk you are exposing your practice to while keeping end users happy is why we invented AutoElevate. Is it possible to keep your client’s computers secure while still keeping them happy with your service? It is if you have AutoElevate. With one touch you can eliminate the challenge of limiting client permissions, control the risk of your practice and keep your clients satisfied. All in real time. From 20 years as an MSP yeah, it’s kind of our thing. We all hate paperwork and usually forget to do it but now that’s not a problem. Detailed information about what was requested, by whom, on what machine, security disposition, status, outcome, and all the other details are recorded for you automatically. Now you won’t have to stress about losing track of your client interactions because each request generates a ticket in your ticketing system automatically. It’s all done for you. Keeps your client informed and eliminates phones calls and remote sessions. Each technician response generates a time entry automatically as part of the natural workflow. 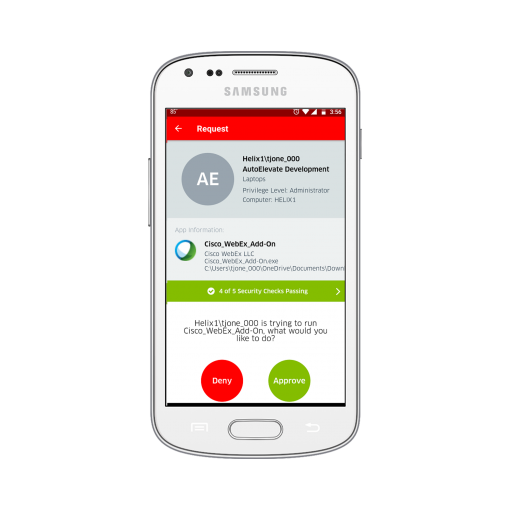 Now your technicians can respond to client requests even when they are mobile without letting billable hours get lost. With each approval or denial the technician can select whether the same action should apply in just this single instance or as an ongoing rule for the computer, location, company, or the entire MSP practice. Client facing dialog boxes and communication are customizable with your brand. Sold to end user companies only through our MSP partner companies. The Admin Portal allows you to sort, filter, and group information for a particular computer, location, company, or your entire practice allowing you to quickly identify areas for improvement and take action. Immediately put that plan into action by turning Windows UAC on/off, changing UAC levels, or building privilege elevation rule sets based on real-time information in just a few clicks. AutoElevate is lightweight and deploys quickly and silently in ‘Audit Mode’. Within minutes of deployment you’ll have actionable information about user privileges and privilege events that is easy to understand right at your fingertips. Approve or deny elevation requests, make rules, look at elevation events, harden client computers, and more - all from your favorite browser. AutoElevate was built from the ground up with integration to the most popular PSA and RMM solutions in mind. ConnectWise Automate® and ConnectWise Manage®, Autotask PSA®, & Kaseya BMS® are currently integrated with more on the way soon. AutoElevate will fit seamlessly into your workflow. Approval or Denial of elevation requests, rule building, & status can all be done effortlessly on the go from your favorite device. No more building complicated policies, rolling a truck to stand over your client’s shoulder and enter admin credentials, or having to coordinate a good time to remote into their machines. Privilege management for MSPs has to be easy, keep clients happy, provide instant ROI, and not just be one more complicated and expensive system to manage. Now with AutoElevate’s patent-pending Real-Time Privilege Management system that goal can be a reality. Finally, there is a way to keep your client environments secure, keep end users happy, reduce risk for your practice, and reduce workload on your technicians.